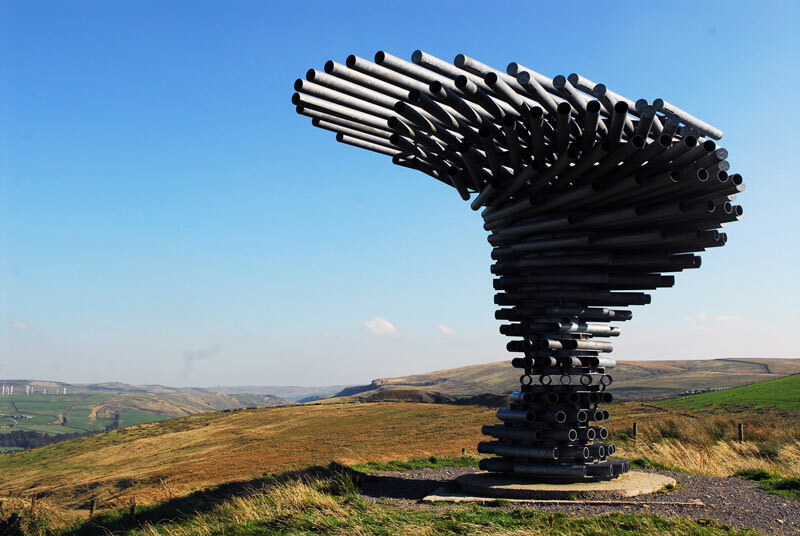 The Singing Ringing Tree is a musical sculpture standing in the wind on a hill (Crown Point) overlooking Burnley, UK. From far and wide, the tree’s profile is visible on the horizon, appearing and disappearing in the mist. The tree is constructed of stacked pipes of varying lengths, orientated to lean into the directions of the prevailing wind. As the wind passes through the different lengths of pipe, it plays different chords. Each time you sit under the tree, looking out through the wind, you will hear a different song (check out the embedded video below). Designed by architecture firm Tonkin Liu, it was completed in December of 2006. It is one of a series of four ‘Panopticons’ (meaning a structure, space or device providing a comprehensive or panoramic view) artworks located across Pennine Lancashire. The Panopticons are a unique series of 21st century landmarks, designed to attract visitors into the countryside to enjoy the stunning landscapes and wealth of attractions on offer in Pennine Lancashire. Each Panopticon is situated on a high point site commanding spectacular views, and are all within easy reach of the M65 motorway. You can learn more about the ‘Panopticons’ here. You can find directions to the Singing Ringing Tree here.